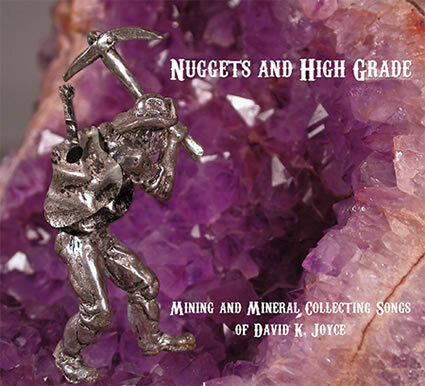 David K. Joyce has been a musician and songwriter longer than he has been a mineral collector and dealer! In the last number of years, David has, for some unfathomable reason, written increasing numbers of songs about mining and mineral collecting! By popular demand, he decided it was about time to do something with them. Mineral collecting songs?! These are all amusing, technically correct, field collecting-oriented songs about mineral collecting, geology and mineralogy. You’ll be able to tell right away by the titles of the songs that these are not ordinary songs: “Agate Lickers”, “Crystal Systems”, “The Mineral Dealer”, “Diggin’ in a Hole” and “The Crystals That I’ve known” all give a hint that these songs were written BY a mineral collector FOR mineral collectors. Who else would write them!? Unlike many mining songs, most of David’s mining songs are upbeat songs about mining life. The “Packsack Miner”, is a tribute to the “tramp miners” that were prevalent during the days of small mines in North America. “Highway 17” is a poignant song about life and travails in a mining town where the mine has shut down. “Miner’s Home Tavern” is a ditty that immortalizes the old drinking hole at Cobalt, Ontario where generations of miners have gathered to tell stories. David spent happy hours there when he attended the Haileybury School of Mines, just a few minutes away! David has been performing some of these songs for years to mineral friends on field trips and at mineral shows. They seem to like them! This made him decide to record some of the songs and distribute them to interested people! After all, the more people become familiar with them, the more people will be able to sing along at the right time! Every Mineral collector should have a copy! How can you buy this music? You can order a CD directly from me. Just send me a letter or e-mail dkjoyce@bellnet.ca and request the CD. Price is $15.00 plus $3.00 postage in North America ($4.00 postage elsewhwere). If I have your credit card on file, just tell me to charge it to that card. You can forward a cheque or money order for $18.00 to David K. Joyce, Box 95551, Newmarket, Ontario, Canada, L3Y 8J8. You can send payment by a PayPal or e-mail bank transfer to dkjoyce@bellnet.ca. I'll send a CD to you! You can purchase this CD via CD Baby using your credit card. Use this link to CD Baby: http://www.cdbaby.com/cd/davidkjoyce. They’ll send a CD to you! You can purchase/download all of these songs from iTunes and download them onto your computer, smart phone or iPod. You can drop by and pick one up from David, if you live nearby, or happen to be Newmarket and play it on the way home! Ask for a copy of the CD to be included in your next mineral specimen order!